Al Ain, UAE. December 30, 2010: Team Viper, the world’s only Hawker Hunter fighter jet display squadron, has joined the impressive list of international aerobatic and display teams that will headline the 2011 Al Ain Aerobatic Show, organised by the Abu Dhabi Tourism Authority (ADTA). 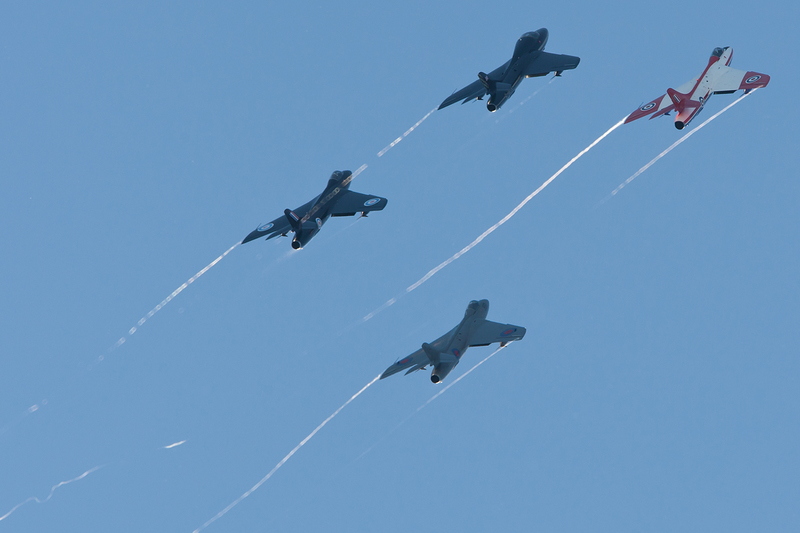 With serving or former members of the British Royal Air Force piloting all four of Team Viper’s supersonic jets, the squadron’s dazzling formations will be one of big draws at the world-famous show, which runs from February 2-5 at Al Ain International Airport, on the edge of the Oasis City. Each Hunter aircraft, named after the Rolls Royce Viper engines that power the jets, weighs over 9 tonnes, produces over 10,000 lbs of thrust and is capable of speeds approaching 1,000 kilometres per hour. “Flying over the stunning Arabian desert for the Al Ain Aerobatic Show last year was a truly memorable experience,” added Chris Heames, who has over 6,000 hours experience as a display pilot and will captain the Team Viper squadron. Now in its ninth year, the Al Ain Aerobatic Show is firmly established as one of the world’s top five aerobatic events. Crowds of 130,000 are expected to watch the world’s top pilots manoeuvre their agile aircraft in four days of drama in the skies above Al Ain. Taking centre-stage at the 2011 event will be the unique, multi-discipline FAI Desert Challenge. Arranged by the Fédération Aéronautique Internationale, the world air sports federation, the Desert Challenge will see six world-class pilots flying CAP232, Sukhoi 26 and Xtreme aircraft, in a classic and free-style format competition. 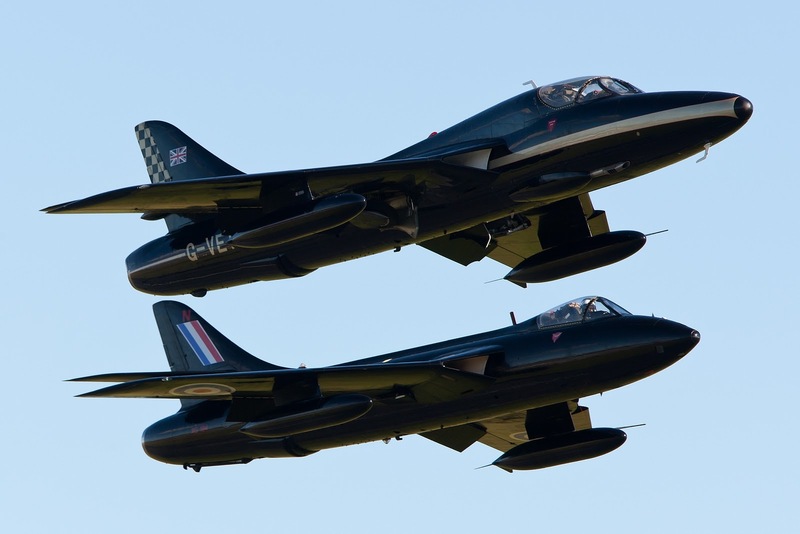 Making their Middle East debut will be the Baltic Bees from Russia, flying L-39C Albatros twin-shaft jets at speeds topping 900 km/h, while the eye-catching bravado of Miss Demeanour, a Hawker Hunter built for Britain's Royal Air Force as a mark F.4 XF947 in 1956, is back for a second consecutive year. For 2011, ADTA has significantly expanded the spectator village to make it the largest to date. Among the wide range of activities on offer for all the family will be karting, model aircraft displays, state-of-the-art simulators, helicopter flights and F&B outlets catering to every taste. ADTA is also offering one lucky enthusiast the chance of a lifetime to fly with one of the world-class pilots at the show via the official website www.alainaerobaticshow.com. The Al Ain Aerobatic Show is held under the patronage of HH General Sheikh Mohammed bin Zayed Al Nahyan, Crown Prince of Abu Dhabi and Deputy Supreme Commander of the UAE Armed Forces. Commonly known as the Oasis City and central to the cultural heritage of the country, Al Ain is approximately 80 minutes drive from Abu Dhabi and Dubai, with both drives offering stunning views of the golden desert landscape as it transforms from stunning dunes into a verdant oasis. Dubai Municipality on Wednesday held a special ceremony to honour the employees who contributed feasible suggestions under the "Have Your Say" Suggestions Scheme of the civic body. It was the 12th such ceremony, where Municipality staff members and customers who had submitted ideas and suggestions that would enable developing the work in the Municipality. Eng. Hussein Nasser Lootah, Director General of Dubai Municipality, who delivered the inaugural speech in the ceremony, said the Municipality has always been keen to find and activate appropriate channels for the participation of internal and external customers for submitting ideas and express views. "The Higher Committee for Suggestion Scheme was formed in 2000, so as to establish procedures and systems as an encouragement to submit suggestions and to be a tool and a means to stimulate innovation and attract suggestions by internal and external customers and appreciate the contributors," he said. "The Suggestion Scheme launched by the Municipality was a programme with the involvement of everyone on whatever we do to improve. This schemed has evolved significantly since its inception in 2000, as the number of suggestions received during the second half of 2010 was 2,459 suggestions," Lootah pointed out. "The scheme opens doors to freedom of creativity and coming up with ideas that can be applied, not just admiring, in order to ensure a decent life for this generation and future generations. The scheme also aims to provide useful suggestions that serve the goals and objectives of public interest and to confirm that this scheme is one of the most effective programmes aimed at improving the level of services provided by the Municipality, which also include benefit for employees and the external audience who are receivers of the services," he said. "It is also aimed to consolidate the foundations of partnership between internal and external customers in the operations for improving the administrative, social and environmental standard in the Emirate of Dubai," said Lootah. He added that it is part of the Municipality's keenness to contribute to the application of the principles of total quality and continuous improvement of working methods to ensure quality services and products. "It is also an emphasis on the principle of active participation of all by highlighting the potential capabilities and creative ideas, and contributes to the rationalization of expenditures in order to save time, effort and money. We also want to encourage a spirit of cooperation by providing the opportunity to benefit from the experiences and ideas of everyone, and simplify procedures, and shorten the time, speed up the response, improve organizational performance, and enhancing the participation of all sections of the society in different processes to improve the services available in the city, and achieving the satisfaction of both internal and external customers," said Lootah. Pointing towards the lessons learned from the Suggestion Scheme at the Municipality level, he said it has created a sense of competition among staff of all categories, built working teams and committees for new projects designed by the employees, integrated ideas and solved problems in different ways, encouraged creativity, innovation, helped to move away from routine methods in the implementation of tasks, used the simplest ways to provide services, added new services to raise the level of services, encouraged staff to see the latest experiences, techniques and practices in their field, and gave every employee full confidence in providing ideas and increasing staff loyalty," said Lootah. A total of 32 suggestions were honored during the ceremony, out of which 12 were material tangible suggestions and 20 were moral suggestions. The tangible suggestions contributed in achieving material results such as savings or income to Dubai Municipality and the other group of suggestions had a significant effect in raising the performance level of the organization. Among the honoured were Khater Hassan Al Nuaimi and Ahmed Mohamed Saleh (Finance Department), Shoaib Mohammed Al Awadhi and Nora Abdo Al Safari (Public Health Services Department), Maryam Bin Fahad (Customer Relations Department), Farah Ali Al Zarouni and Hind Al Rahma (Dubai Central Laboratory Department), Mohammed Bashar Hafiz (Sewage Water Treatment Plant Department), Khalid Bakhit Al Mas (Contracts and Purchasing Department) and Yasser Al Haj Abdullah (Assets Management Department). The honoured among suggestions of moral value were Eng. Hamdan Khalifa Al Shaer, Director of Environment Department, Khalid Ali Bin Zayed, Director of Municipality Centres Department, and Mohammed Ahmed Al Louz, Head of DM Call Centre in the Customer Relations Department. Also honoured were Salim Ahmed Al Ablam, Mohammad Sharif Farouq and Ali Abdullah Al Jaroodi (Waste Management Department), Saeb Adil Ashneneh and Mufid Mustafa (Sewage Network Department), Abdul Aziz Al Khaja and Ali Zayed Al Busaidi (Finance Department), Sajan John (Environment Department), Abdullah Mohammed Al Nadhari, Amina Ahmed Arif (Municipality Centres Department), Imad Jandali Rifai, Amani Mohammed Al Souri (Public Health Services Department), Tahseen Rasheed Harbou, Ahmed Jouda, Tariq Jaafar and Mahmoud Yassin (Sewage Water Treatment Plant Department), Muath Manna (Information Technology Department) and Abdul Rahman Sayed and Ahmed Ali Elian, Abdul Moneim Syed Attiya (Dubai Central Laboratory Department). Among the external customers who were honoured were Dawood Ragheb Al Dahoudi, Yousif Al Ali, Khalid Sayed Ahmed, Mona Obeid Al Zabi, Mahmoud Abdo Nasser, Essa Abdulrahman Al Shaami and Ali Ahmed Mashail. Among those honoured for the most number of participation in the Suggestion Scheme from customers were Somayya Ahmed Abdullah, Basil Najib Al Obeidi and Saeed Saif Bin Touq. The best suggestion coordinator among the employees was Alaa Zaki Badruddin (Sewage Water Treatment Plant Department), and the best customer complaint coordinator was Samira Ahmed Ghanem (Buildings Department). The organizational units were also honoured for their outstanding efforts to make the Suggestion Scheme a huge success. They included Sewage Water Treatment Plant Department, Municipality Centres Department, Financial Auditing Department, Finance Department, Corporate Marketing and Relations Department and the team from the Advertising Section. business group, Al Sayegh as its first venture into the world of fashion. the country with its Turkish finesse and stylish designs. been more towards electronics,” he added. NetWork reflects the dynamism of modern and urban life on fashion with a realistic approach. and men from day to night. The label offers both formal and casual lines of clothes. selling space of 3400 square meters as the first fashion label of Mr. Ay Marka Mağazacılık. 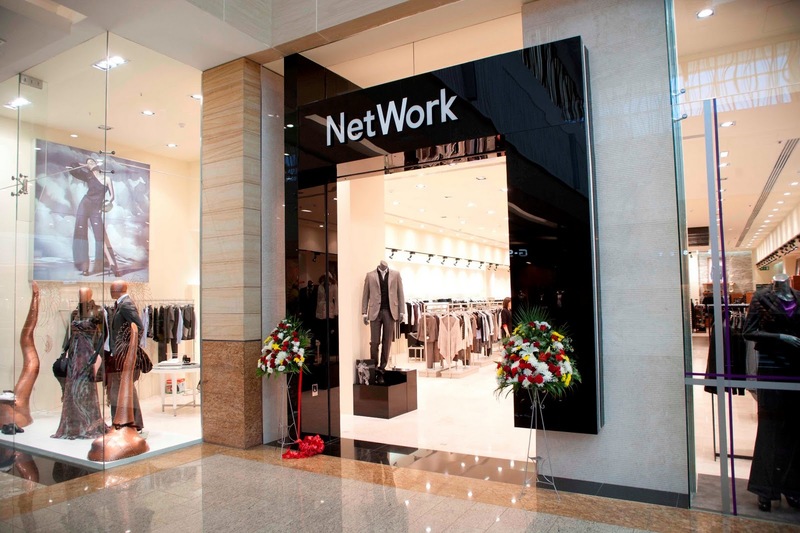 Today, Network has a commendable total of 76 sale points in Turkey. the UAE, Al Sayegh Brothers Trading has business interests in Qatar and Morocco. 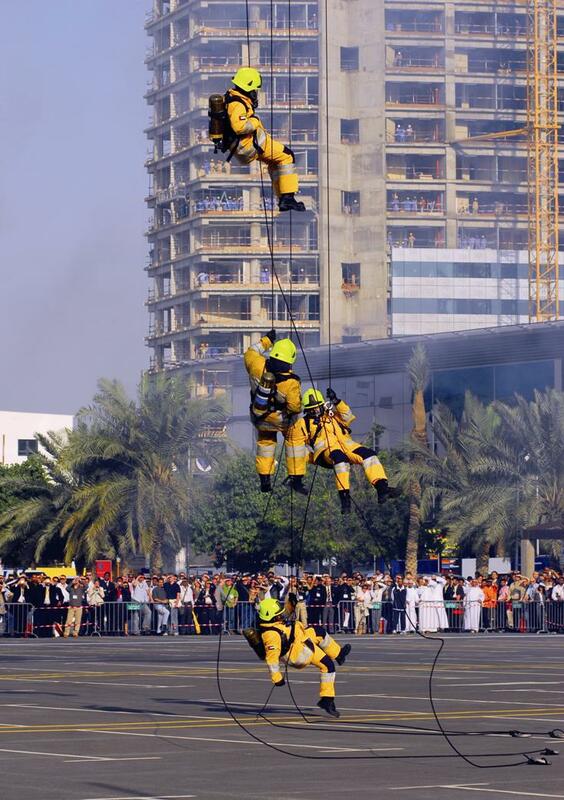 DUBAI: Select teams of fire and rescue personnel from across the region will vie against each other in a test of fitness, expertise and skill, at the 2nd UAE International FireFit Championship, taking place during Intersec Trade Fair and Conference at the Dubai International Convention and Exhibition Centre in January. Held under the patronage of H.H. Sheikh Mansoor bin Mohammed bin Rashid Al Maktoum, the ‘UAE International FireFit Championship also enjoys the support of Mohammed bin Rashid Establishment for SME Development and Dubai Civil Defence. After a popular debut at Intersec 2010, the championship is back bigger and better. Teams from all seven emirates of the UAE, the best fire-fighters from Kuwait and other stalwart teams from across the GCC will cross swords with Canada for top honours during this three day event. The UAE International FireFit Championship is being organised jointly by 911 Fire Fighting and FireFit of Canada with the encouragement and support of Dubai Civil Defence. The event is sponsored by Naffco. Fire-fighters will compete against each other in full turnout gear - including helmet, fire-retardant gear, boots, gloves and breathing apparatus - over the following six categories: Stair Climb; Hose Hoist; Forced Entry; Run over set course; Hose Advance and Victim Rescue. Competing teams will try to finish the set tasks in the least amount of time. Taking place from January 16 to 18, 2011, Intersec Trade Fair and Conference is the largest and most comprehensive trade and networking event for the health and safety, fire and rescue and security and policing industries in the wider Middle East region. The trade exhibition brings together under one roof: health, safety and security experts; fire and rescue professionals; manufacturers and distributors of equipment and systems relating to the industry; prospective clients; government officials; and key decision makers who have a stake in the development of the security industry in the region. Apart from the UAE International FireFit Championship, Intersec 2011 will also feature the Intersec Conference, an extensive outdoor demonstration of counter terror and tactical deployment methods and the Exhibitors’ Experts Forum. DUBAI, UAE - 30th December, 2010 - Calogi (www.calogi.com), the largest air-freight portal solution in the Middle East, is celebrating two successful years of providing cutting-edge, cost reducing, eco-friendly solutions to the air cargo supply chain community. The first of its kind in the air cargo community worldwide, Calogi was launched in 2008, and over the past two years, has achieved many significant milestones. During this short period, Calogi has experienced phenomenal growth - the companies subscribing to the portal currently number more than 400, forming a user base in excess of 1,195 who have together conducted more than two million successful transactions to date. The overall number of users, transactions and customers is expected to double year-on-year. The overwhelming impact of the state-of-the-art innovations and services that Calogi has introduced, has not only significantly improved the efficiencies of the air cargo industry, but has also changed the way in which the community at large conducts air cargo business. Its pioneering paperless cargo systems and ‘green’ operation can potentially eliminate the need for over 3.5 million air waybill copies that accompany export shipments every year from Dubai alone. In Calogi’s digital world, where the export forwarder no longer has to distribute paper copies of the air waybill to his trading partners, significant productivity gains are also expected. Calogi’s on-line archiving and retrieval system also removes the need for printing a paper copy of the air waybill for filing purposes. To date, Calogi is processing over 70 per cent of the Dnata CTO shipments electronically. Enabling the industry to remove the paper air waybill and accompanying documents from all shipments processed via the Dnata terminals will result in cost savings to the industry. IATA estimates these costs at around US$4.9 billion annually, once e-freight is implemented across the globe. Since its launch, Calogi has been at the forefront of many innovations including its IATA electronic air waybill (e-AWB) solution. Other successes include the comprehensive credit management engine, which allows Calogi to act as a clearing house between buyers and sellers of services and the ad-hoc air waybill release feature, which allows more than 90 airlines represented on the portal to do business with over 300 forwarder companies. These and the many other ground-breaking developments, culminated in Calogi winning the prestigious top twenty CIO award in November 2009. Calogi's wide range of state-of-the-art cargo services encompasses an entire network of on-line business components for the air cargo industry stakeholders, which include freight forwarders, airlines, logistics operators, customs and 3PL providers. The first of its kind in the air cargo community worldwide, Calogi's web applications have been designed and developed after several months of meticulous research on the current and future demands of the industry. By creating a ‘virtual’ business environment for a wide variety of cargo industry players, Calogi enables the supply chain community to complete transactions without leaving their office or home, eliminating the need for face-to-face office meetings and lengthy waits on the end of a telephone. Calogi removes outmoded paper-based and labour intensive processes, by creating a one-stop, integrated internet-based communications solution, catering to the needs of the worldwide airfreight industry. Dubai-UAE: 29 December 2010 - Global Village, the premier cultural, shopping and family entertainment destination, today announced lights, fireworks and laser shows will usher in the New Year 2011, offering visitors an opportunity to share in the excitement at the most popular venue for outdoor events. The specially-organised activities will start at 10:00pm on 31 December and will continue till the stroke of midnight that marks the beginning of the New Year. A total of 12 music groups will be visiting various pavilions across the Global Village before fireworks commence and the countdown ends. Special offers and attractive bargains also await visitors to the 28 pavilions during the New Year weekend. In addition, a spectacular array of activities including art shows, special performances at individual pavilions and dedicated programmes will be part of the offerings during the period. 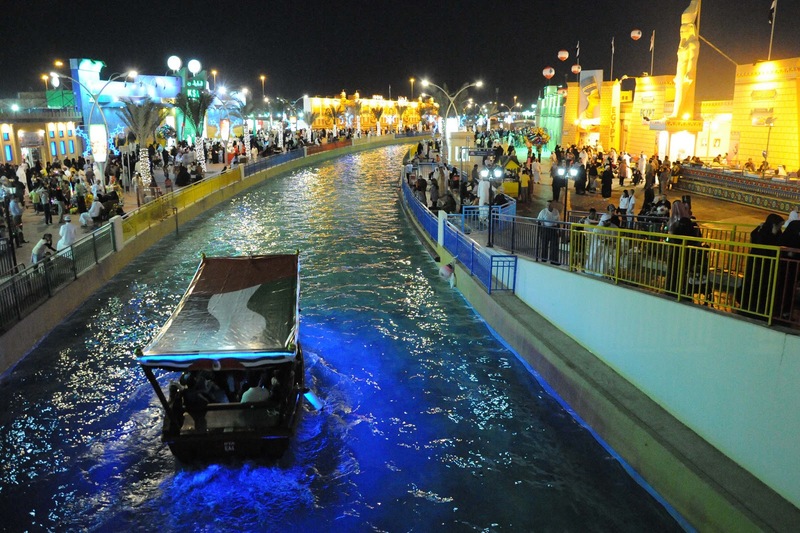 The 15th edition of Global Village continues to draw visitors in large numbers since it opened on 10 November. More than 45 rides that populate the Fun Fair at Global Village currently provide exciting leisure options for visitors of all ages. In addition, new facilities and complementary services at the venue contribute to shaping a perfect platform for entertainment and retail experience. 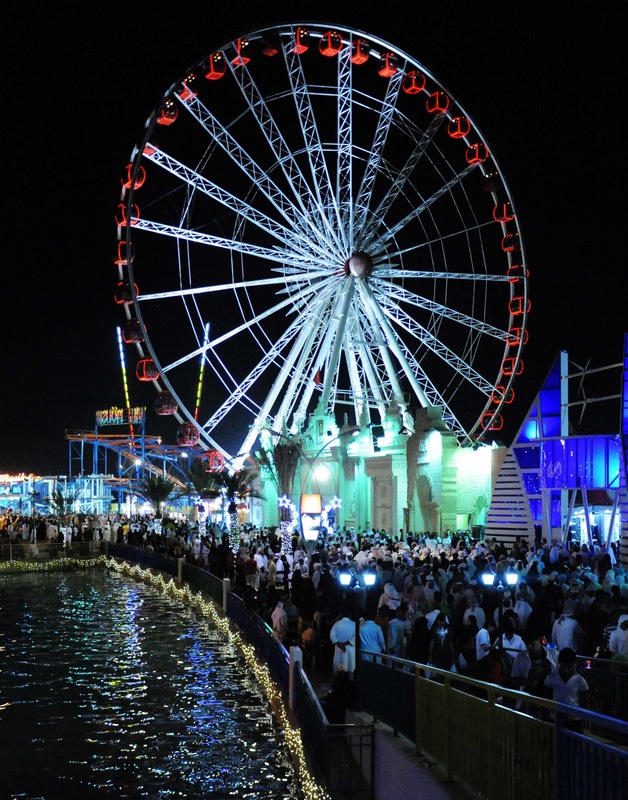 The 111-day season of the Global Village will run until 28 February, 2011. For more information about the shows and activities at Global Village, please contact 04-3624114 or visit www.globalvillage.ae. Also, stay tuned to Global Village updates through Facebook and Twitter (GlobalVillageAE). Abu Dhabi, UAE (29 December 2010) – Finding a roadmap for sustainability is a core value of Masdar’s long-term economic vision, and the journey begins internally with its employees. “The START initiative,” Masdar’s employee sustainability campaign, teaches that change happens at the individual level with better decision making and environmentally-conscientious lifestyles. Masdar encourages its employees to be aware and accountable of the environmental impacts of their everyday actions, and the START initiative is a constant reminder. Masdar’s sustainability framework is designed to integrate economic, environmental, and social considerations into Masdar’s corporate strategy, daily operations and internal culture. The sustainability framework is a structured approach to thinking about the risks and opportunities of sustainability. The framework is comprised of four primary components: Masdar strategic sustainability goals, the organisational factors driving sustainability behaviour, identification of relevant sustainability themes and issues and identification of the key sustainability performance enablers. The START initiative’s most recent efforts included a week-long sustainability awareness campaign for Masdar staff. Recently, nearly 200 Masdar staff signed a “sustainability pledge” and committed to promoting and living a more sustainable lifestyle. During the week, the campaign focused on key sustainability areas — waste, water, energy, and transport — providing staff with practical solutions to make significant change. For example, during the second day dedicated to water, Masdar displayed a compelling visualization that compared the amount of water used for a conventional, single car wash against a waterless carwash solution. On average a “driveway” car wash consumes 300 litres per wash while a “drive-thru” consumes 110 litres per wash. The “water-less” solution only uses 200 milliliters of water per wash and relies mainly on environmentally friendly cleaning agents. “While the world waits for mass-scale integration of renewable energy, and game-changing innovations in clean technology, as individuals we are in a position to minimise our impacts on the environment and to reduce our demands for energy by making better decisions,” said Dr Sultan Al Jaber, CEO of Masdar. “Climate change and energy security are real issues, and it’s time for businesses to adapt and recognise the importance of being sustainable. The START initiative ensures that we at Masdar are following these principles, as we help transform Abu Dhabi to a knowledge-based economy rooted in the commercialisation of renewable energy and clean technology innovations. The START initiative is more than just education, it is about measurable results. Masdar recently integrated smart meters to monitor energy consumption. Water, waste, as well as carbon emissions associated with staff commute are being measured and published as well. Integrated within the Masdar Sustainable Administration Facilities, the system will be used to gauge behaviour changes and identify a calculable index for Masdar’s sustainability. An additional incentive to this initiative, which companies across the world should focus on, is that operating more sustainably greatly impacts their financial bottom line. Where money is saved on using fewer resources it can be invested elsewhere. This helps organisations meet their core business targets and facilitate wider economic growth, thus supporting financial sustainability. Dr. Al-Hosany is a recognized leader in sustainability, and was recently elected a member of the General Secretariat of the Abu Dhabi Sustainability Group (ADSG)—a membership organisation whose mission is to promote sustainability management in Abu Dhabi by providing learning and knowledge sharing opportunities for all organisations in the spirit of cooperation and open dialogue. Dubai, UAE, December 29, 2010 – Fujitsu has announced the launch of its LIFEBOOK T580 Tablet PC with 3-way input and a 10.1-inch Superfine HD Display. Weighing only 1.4kg, the LIFEBOOK T580 increases productivity by keeping users mobile and connected to their business wherever they are, while a host of security features keeps data safe at all times. Building on almost two decades of leadership and experience in designing and manufacturing its own products, the T580 is Fujitsu’s latest addition to its Tablet PC family, and is powered by Intel®’s Core™ i5 processor, up to 8GB RAM and a wide variety of SSD and SATA hard disk drives. The LIFEBOOK T580 also comes with 4-finger multiple touch functionality, enabling users to perform actions directly on the screen providing an intuitive user experience. To keep data safe around the clock, the T580 offers the highest security available including features such as the Advanced Theft Protection system, fingerprint sensor and Kensington Lock in addition to Fujitsu’s own security systems. The LIFEBOOK T580’s 3-Way Input means that users have the choice to either touch, write or type, alternating between the signature Fujitsu Stylus Pen, the ergonomic spill-resistant keyboard or use the new 4-point multi-touch technology to perform actions, such as arranging items and files, directly on the screen. This latest 4-point multi-touch functionality offers a rich gesture vocabulary, opening up a whole new approach to interacting directly on screen that provides users with a unique tablet experience. Consumer and business users looking for the ultimate viewing experience can enjoy a sensational video and audio experience thanks to the built-in HDMI and VGA output while the 10.1-inch SuperFine HD TFT display with auto brightness control runs on Intel®’s HD Graphics processor providing stunning 3D graphics and shading effects. The perfect solution for business users working on the move, the T580 has an auto-rotating screen, finished with bi-directional hinges for increased mobility, while auto brightness control – using the light-sensitive ambient light sensor – ensures that the screen is clearly visible from virtually every angle by automatically adjusting the brightness of the LED display according to the ambient light conditions, helping users save battery power without compromising performance. The 1.4kg lightweight, portable, wireless notebook runs on the energy-saving Intel® CULV platform and has a prolonged battery life, capable of running for over 9 hours with a choice of either 3-cell or 6-cell Li-Ion batteries. Embedded 3G/UMTS combined with integrated GPS, WLAN and Bluetooth guarantee connectivity and enable users to stay productive and in touch with their digital world wherever they are. Priced at AED 4,999, the new LIFEBOOK T580 is currently available at leading retail outlets across the UAE. 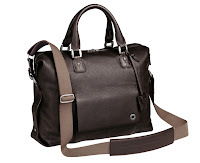 Meisterstück Soft, Montblanc’s new men’s leather goods line, offers five bags, six small leather goods items plus a stunning Limited Edition in three colours. Montblanc Meisterstück has been created for the active professional to flaunt stylishly on the go, or while enjoying some relaxing downtime. The Meisterstück Soft collection is also the perfect complement to the already existing classical Montblanc Meisterstück leather collection. JAMAL BIN MARGHOOB- “SEMINARS IN SINGAPORE AND MALAYSIA SHED LIGHTS ON THE FACILITIES AND QUALITY SERVICES DUBAI AIRPORT FREEZONE PROVIDES. In their quest to find close accessibility to the Middle East markets, many Japanese companies have shown interest to establish their businesses in Dubai Airport Freezone, discloses Mr. Jamal bin Marghoob, Sales Deputy Director. “I had the opportunity to talk to the senior executives of many major and medium sized companies who showed strong response and enthusiasm to find a base in Dubai and in Dubai Airport Freezone in particular,” added bin Marghoob. “I met with many decision makers and underlined the advantages of being part of one of the world’s leading freezones. I explained about the immense commercial opportunities available to companies operating out of Dubai Airport Freezone. Mr. Marghoob briefed investors explaining the Freezone’s exponential growth taking advantage of suitable location in the center of Dubai and close to the international airport. “Companies were attracted to Dubai Airport Freezone by benefits offered to investors such as no import duties, tax exemptions and investment incentives. As a matter of fact, Freezone has a unique advantage, being the only freezone located near the international airport, which attracts companies working in various sectors including, Logistic & Cargo, Pharmaceuticals & Cosmetics, Aviation Industry, Telecommunications, Building and Electrical material and Jewellery. Mr. Marghoob also presented an update on the services provided in the Freezone, its future expansion plans, and the advantage of setting up a business there. “Dubai has become a vital trade centre for companies looking to operate in the Gulf region as it ensures safety, security, stability & transparency in laws and legislation,” Bin Marghoob concluded. JETRO Singapore organized the Singapore leg of the seminar, while the Kuala Lumpur, Malaysia seminar was organized by JETRO Malaysia. Dubai Airport Freezone has been named the Best Freezone in the Middle East region and the Second Best in the world by the premier Foreign Direct Investment (fdi) magazine of Financial Times. Apart from this award, Dubai Airport Freezone also won the Second Place in "Best Transport Links" in the world. DUBAI, UAE – 29 Dec. 2010 – Emirates SkyCargo, the freight division of Emirates airline, has set new records by operating its longest ever non-stop flight - 17.5 hours from Sydney to New York. Emirates SkyCargo’s new generation Boeing 777 Freighter operated the service, which arrived on 28th December. “Since the Boeing 777F’s introduction to our fleet in March 2009, we have been impressed by its range, as well as efficiency, and this milestone flight is testament to that,” said Ram Menen, Emirates’ Divisional Senior Vice President Cargo. “The Boeing 777F boasts the longest range capability of all twin engine jets, is quieter and uses less fuel per tonne than other freighters, which are all increasingly important as the industry demands more environmentally sound practices globally. “This freighter is part of our long-term investment for Emirates SkyCargo, we are excited about its performance so far and the future possibilities it brings to our services,” added Menen. Previously the longest flight undertaken by Emirates was a 16.8-hour passenger flight between Dubai and Houston International Airport. The consignment of highly valuable horses on EK4931, potentially worth more than the aircraft itself, all arrived at Stewart International Airport safely. Emirates is the largest operator of the Boeing 777 aircraft in the world. The airline currently has 86 Boeing 777s in its fleet, including two Boeing 777 freighters. Emirates' 152-strong fleet is one of the youngest in the skies. Emirates SkyCargo’s fleet includes seven freighters (three Boeing 747-400Fs, two 747-400ERFs and two 777Fs) and now serves 109 destinations in 65 countries on six continents. In 2010, the carrier has already won a clutch of awards: ‘Cargo Airline of the Year’, ‘Best Cargo Airline to the Middle East’ and ‘Best All Cargo Airline’ at the prestigious Cargo Airline of the Year Awards 2009 from Air Cargo News. It was bestowed the Gold Award at the Annual Air Cargo Excellence Awards at the IATA World Cargo Symposium. All animals, including domestic pets transported are constantly supervised for their safety, comfort and security, right from acceptance to delivery, in an environment designed to ensure their welfare. While animal welfare is the first priority, Emirates SkyCargo also ensures that the often complex requirements of regulatory authorities are met to avoid unnecessary delays at any point and guides the shipper about documentation, container requirements and other IATA Regulations. The same detailed attention and IATA credentials that apply for the transportation of live animals equally extend to the transportation of horses. Emirates SkyCargo provides specialised horse stalls, simplified loading and offloading operations using a unit-load device, and independently controlled air-conditioned zones to ensure horses are accommodated in maximum comfort and security. A team of expert veterinarians and equine specialists are on hand throughout the flight and grooms are also permitted to accompany horses. With a fleet of state-of-the-art freighter aircraft and the dedication of our expert personnel, the wellbeing of both domestic and wild animals is assured. Despite the advent of the electronic age with its increasingly computerised, paperless work and domestic environments, global demand for writing instruments continues to grow steadily. In fact, market research has indicated that the world market for writing instruments was expected to be worth US $18.3 billion by this year. Leading German trade fair and conference organiser, Epoc Messe Frankfurt, who is bringing Paperworld Middle East – a trade event for office and paper products – to the region for the first time will tap into this market. “Writing instruments remain popular the world over, despite changing methods of written communication,” said Ahmed Pauwels, Chief Executive Officer of Epoc Messe Frankfurt. “Demand is growing, both for bespoke writing instruments at the high end of the scale and for more basic writing products in emerging economies,” he added. Industry experts feel that growth in the developed markets will be largely driven by innovation and creative marketing. The Asia-Pacific, African and Latin American markets in this sector are set to grow at a considerably higher rate than the rest of the world. Projected growth rates in the Asia-Pacific region indicate a robust CAGR of 5.3 %over the 2000-2010 period for the writing instruments market. Epoc Messe Frankfurt expects this buoyancy in the market to be reflected with strong interest in the sector at their debut trade show. Paperworld Middle East, will be held at the Dubai International Convention and Exhibition Centre from March 7-9, 2011, and seeks to establish a comprehensive trading and networking platform for those involved in office supplies, paper products and stationery in the region and beyond. 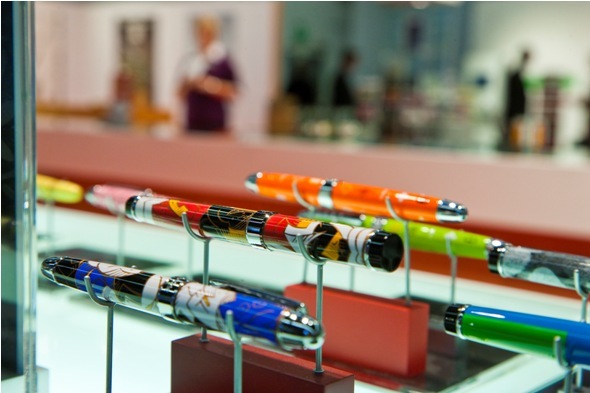 Many leading suppliers of writing instruments have already signed up for the event including: Lamy, Pelikan and Schneider Pens from Germany, and Al Gurg Stationery representing German brand Edding. In addition Farook International Stationery from the UAE will showcase their own full range of writing instruments and other brands at the show include Lexi Pens, Rotomac Linc Pens, Elkos and Today’s Writing from India, Dollar and Signature from Pakistan and Simbalion, to name a few. Paperworld Middle East, aside from writing instruments, will also feature office supplies, office and household papers, gift articles, greeting cards, stationery and school articles. The trade exhibition is based on the world leading trade fair in the industry, Paperworld, which will run from January 29th to February 1st in Frankfurt, Germany which is organised by leading trade fair organiser Messe Frankfurt. Dubai, UAE (29 December 2010)—Senior business and technology leaders will convene at InterContinental Dubai Festival City from 21-22 February 2011 for CACS (Computer Audit, Control and Security) in Dubai, an internationally respected event that features governance, security, assurance and risk management experts from around the world. The event is hosted by ISACA, a global information technology (IT) association of 95,000 IT professionals. ISACA chose Dubai as the location for the conference because it is an important city in the global economy as well as the region's crossroads, serving as a center of business and technology. CACS in Dubai will include a keynote presentation by Neeraj Kumar, Senior Vice President of Internal Audit and Chief Audit Executive of Emirates Group. Neeraj Kumar will explain how to use technology to improve proactive risk-focused auditing and continuous monitoring. CACS in Dubai will also offer educational sessions on key IT security and governance issues facing enterprises today and include case studies by Dubai Aluminium and Dubai Customs. Additional topics that will be presented include The Threats and Challenges of E-government Security; The Future of Information; and Designing Security for Cloud Computing Environments. ISACA's United Arab Emirates Chapter was established in 1997 to bring together business and information technology leaders in the region. The ISACA UAE Chapter is a strong network of professionals from all the emirates of the UAE: Abu Dhabi, Dubai, Sharjah, Ajman, Umm Al Quwain, Ras Al Khaimah and Fujairah. “CACS in Dubai will help attendees add value to their enterprise by providing them with practical guidance on critical IT-related issues facing organizations worldwide,” said Vatsaraman Venkatakrishnan, CISA, CISM, CGEIT, CRISC, Vice President of IS audit at Emirates Airlines and Chair of ISACA’s Conference Development Task Force. Attendees who register by 12 January 2011 will receive an early-bird discount. Registration forms for the conference and two pre-conference workshops--Using COBIT for Effective IT Assurance and the Risk Management Workshop: Featuring ISACA's Risk IT Framework and Guidance--are available at www.isaca.org/cacsindubai. With 95,000 constituents in 160 countries, ISACA® (www.isaca.org) is a leading global provider of knowledge, certifications, community, advocacy and education on information systems assurance and security, enterprise governance and management of IT, and IT-related risk and compliance. Founded in 1969, the nonprofit ISACA develops international IS auditing and control standards, which help its constituents ensure trust in, and value from, information systems. It also advances and attests IT skills and knowledge through the Certified Information Systems Auditor® (CISA®), Certified Information Security Manager® (CISM®), Certified in the Governance of Enterprise IT® (CGEIT®) and Certified in Risk and Information Systems Control™ (CRISC™) designations. ISACA continually updates COBIT®, which helps IT professionals and enterprise leaders fulfill their IT governance responsibilities and deliver value to the business.